Ryanair, Europe’s No.1 airline, today (13 June) announced it will open a new base at London Southend, from April 2019, with 3 based aircraft (an investment of $300m) and 13 new routes to 8 countries, including Alicante, Barcelona Reus, Bilbao, Brest, Corfu, Cluj, Dublin, Faro, Kosice, Malaga, Milan Bergamo, Palma and Venice, which will deliver 1m guests annually at London Southend Airport. – 1 million guests p.a. – 750 “on-site” jobs p.a. “We are pleased to add London Southend Airport to our UK base network. 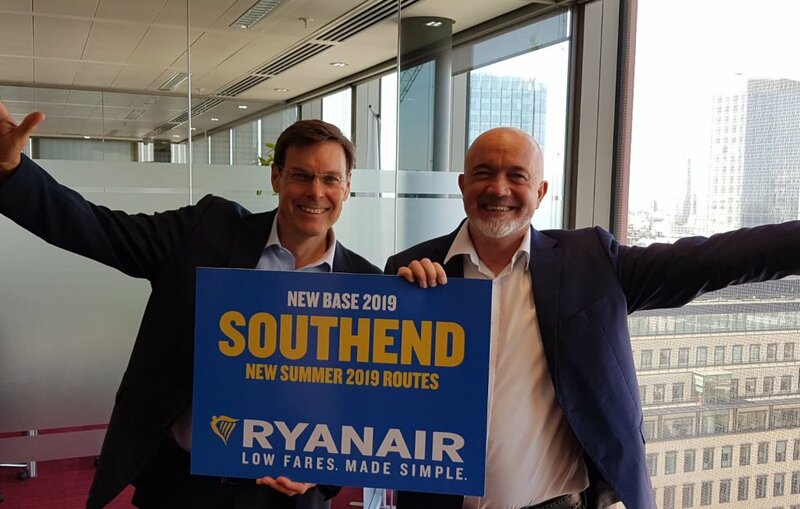 Ryanair guests travelling to and from London and the Essex area can now enjoy low fares on a choice of 13 routes through London Southend’s exceptionally passenger friendly terminal. Southend Airport’s train station will deliver direct services from the terminal to London Liverpool St and also the new Crossrail service (opening in 2019), making the airport even more accessible from all parts of London.